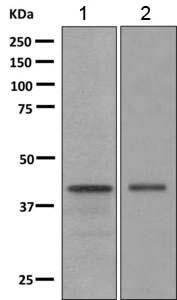 Synthetic peptide within Human Doublecortin aa 100-200. The exact sequence is proprietary. Synthetic peptide, corresponding to residues in Human Doublecortin (UniProt: O43602). Human fetal brain and C6 lysates; C6 cells. Shipped at 4°C. Store at +4°C short term (1-2 weeks). Upon delivery aliquot. Store at -20°C long term. Our Abpromise guarantee covers the use of ab167400 in the following tested applications. WB 1/1000 - 1/5000. Predicted molecular weight: 49 kDa. Flow Cyt 1/100 - 1/500. Seems to be required for initial steps of neuronal dispersion and cortex lamination during cerebral cortex development. May act by competing with the putative neuronal protein kinase DCAMKL1 in binding to a target protein. May in that way participate in a signaling pathway that is crucial for neuronal interaction before and during migration, possibly as part of a calcium ion-dependent signal transduction pathway. May be part with LIS-1 of an overlapping, but distinct, signaling pathways that promote neuronal migration. Highly expressed in neuronal cells of fetal brain (in the majority of cells of the cortical plate, intermediate zone and ventricular zone), but not expressed in other fetal tissues. In the adult, highly expressed in the brain frontal lobe, but very low expression in other regions of brain, and not detected in heart, placenta, lung, liver, skeletal muscles, kidney and pancreas. Defects in DCX are the cause of lissencephaly X-linked type 1 (LISX1) [MIM:300067]; also called X-LIS or LIS. LISX1 is a classic lissencephaly characterized by mental retardation and seizures that are more severe in male patients. Affected boys show an abnormally thick cortex with absent or severely reduced gyri. Clinical manifestations include feeding problems, abnormal muscular tone, seizures and severe to profound psychomotor retardation. Female patients display a less severe phenotype referred to as 'doublecortex'. Defects in DCX are the cause of subcortical band heterotopia X-linked (SBHX) [MIM:300067]; also known as double cortex or subcortical laminar heterotopia (SCLH). SBHX is a mild brain malformation of the lissencephaly spectrum. It is characterized by bilateral and symmetric plates or bands of gray matter found in the central white matter between the cortex and cerebral ventricles, cerebral convolutions usually appearing normal. Note=A chromosomal aberration involving DCX is found in lissencephaly. Translocation t(X;2)(q22.3;p25.1). 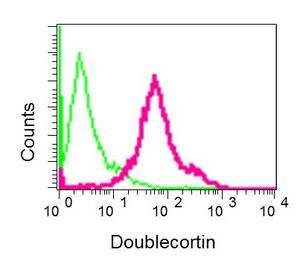 Flow cytometric analysis of permeabilized C6 cells labeling Doublecortin with ab167400 at 1/100 dilution (red) or a Rabbit IgG (negative)(green). ab167400 has not yet been referenced specifically in any publications. Publishing research using ab167400? Please let us know so that we can cite the reference in this datasheet. There are currently no Customer reviews or Questions for ab167400.